Mediumship is the claimed ability of an individual to experience contact with “the spirit world” (spirits of the dead, angels, demons or other incorporeal entities). A “medium” is the term used to refer to a person who claims to communicate with spirits of the deceased and passes on information from the spirit world or Heaven to people on Earth; information which the medium had no way of knowing without the intervention of “the spirits”. Many mediums claim that spirits of the dead communicate with them directly, while other mediums claim the use of a “spirit guide”. Some mediums define a “spirit guide” as a highly evolved spirit with the purpose of helping the medium or their clients develop their personal skills and assist in the person's following a spiritual path. Other mediums define a spirit guide as one who brings other spirits to a medium's attention or carries communications between a medium and the spirits of the dead. Many mediums claim to have specific guides who regularly work with them and "bring in" spirits of the dead. Manipulation of energies and energy systems, known as physical mediumship. A spirit, who communicates with a medium, either verbally or visually, is known as a spirit communicator. A spirit who uses a medium to manipulate energy or energy systems is called a spirit operator. The role of the medium is supposedly to facilitate communication with spirits who have messages to share with non-mediums. Mediums claim to be able to listen to, relay messages from, and relate conversations with spirit, to go into a trance and speak without knowledge of what is being said and/or to allow a spirit to control their body and speak through it. Clairvoyance or "Clear Seeing" -- The ability to see anything that is not physically present, such as objects, animals or people. Some clairvoyant mediums can see a spirit as though the spirit has a physical body. They see the bodily form as if it were physically present. Other mediums see the spirit visually, or it appears as a picture like a photograph in their mind’s eye. Clairaudience or "Clear Hearing" -- The ability to hear the voices or thoughts of spirits. Some Mediums hear as though they are listening to a person talking to them and other mediums hear the voices in their minds as a verbal thought. Clairsentience or "Clear Feeling" -- The ability to have a physical impression of what a spirit wants to communicate, or to feel sensations instilled by a spirit. Clairalience or "Clear Smelling" -- The ability to smell a spirit. For example, a medium may smell the pipe tobacco of a person who smoked during life. Clairgustance or "Clear Tasting"-- The ability to receive taste impressions from a spirit. Claircognizance or "Clear Knowing" -- The ability to know something without receiving it through normal or psychic senses. It is a feeling of "just knowing". 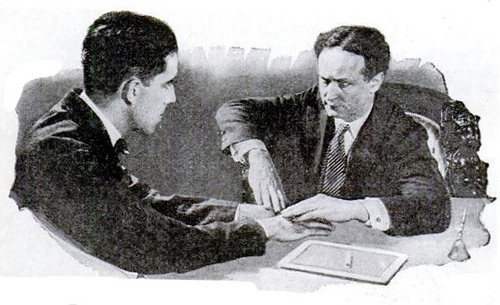 Physical mediumship -- The manipulation of energies and energy systems by spirits. Physical mediumship may involve perceptible manifestations, such as loud raps and noises, voices, materialized objects, materialized spirit bodies, or body parts such as hands, and levitation. The medium is used as a source of power for such spirit manifestations. By some accounts, this is achieved by using the energy or ectoplasm released by a medium. Most physical mediumship is presented in a darkened or dimly lit room. Most physical mediums make use of a traditional array of tools and appurtenances, including spirit trumpets, spirit cabinets, and levitation tables. Spiritualism is religious systems that wherein its members called “Spiritualists” believe in communicating with the spirits of discarnate humans. They believe that spirit mediums are humans gifted to do this, often through séances. They believe that spirits are capable of growth and perfection, progressing through higher spheres or planes. The afterlife is not a static place, but one in which spirits evolve. That spirits can provide knowledge about moral and ethical issues, as well as about God and the afterlife. Attempts to communicate with the dead and other spirits have been documented back to early human history. However, modern Spiritualism is said to date from practices and lectures of the Fox sisters of Hydesville, New York in 1848. Kate and Margaret Fox had been living with their parents in what was considered a haunted farmhouse in which the sounds of unexplained raps and knocks of a departed spirit could be heard. On one night, Kate began to ask the spirits questions, the responses developed into yes and no based on a “knocking” sound supposedly coming from the spirit. 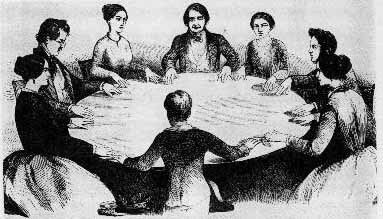 By 1860 the term “Spiritualism” had been adopted and by then the girls had channeled for both famous and not famous people of the time, conducting séances and spirit communication. Kate and Margret, now joined by their sister Leah, began to travel in circles of high society because of their apparent gift of talking to the dead. Very quickly these methods spread like wildfire, with Mediums coming forward claiming spirit contact. In later years, both Margaret and Kate drank heavily and lived a raucous lifestyle, causing Leah and other dedicated spiritualists to be concerned. Margaret and Kate feuded with Leah until finally Margaret made a confession of fraud. Margaret told her story of the origins of the mysterious "rappings" in a signed confession given to the press and published in New York World, October 21, 1888. In it, she explained in detail about how she had learned how to crack her toe joints causing the supposed spirit rapping and that she and Kate had devised methods to convince those attending that the messages were real. Margaret then went on tour exhibiting her toe cracking ability. Margaret recanted her confession in writing in November, 1889, about a year after her toe-cracking exhibition. Kate's first letters back to London after Margaret's exhibition express shock and dismay at her sister's attack on Spiritualism, but she did not publicly take issue with Margaret. Within five years, both sisters died in poverty, shunned by former friends, and were buried in pauper's graves. One of the chief tools used in mediumship and spirit communication is the Ouija Board. The board, along with a heart-shaped pointer on three felt-tipped legs pointer, is used as a means to contact spirits or entities. (The name comes from the French word “oui” and the German word “ja” meaning "yes”) The board includes letters of the alphabet, numerals 0 through 9, the words "yes" and "no. People place their fingertips on the pointer, which moves to answer questions. In most cases answers probably rise up from the user’s subconscious of the users, even when "spirits" identify themselves and giving messages. At times Ouija pointers have been known to fly off the board and spin out of control, as if directed by unseen forces, and some users claim to be harassed by external agents contacted through the board. Most people are unaware of the forces that they may encounter when they dabble, even innocently, in the occult. While the Ouija board remains popular and is sold commercially as a "game”, many experts contend that such contact is inherently dangerous and that any beings who communicate through such a device are likely to be negative, or even demonic and may bring harm the user. Scrying, also known by various names such as "seeing" or "peeping", is the practice of looking into a suitable medium, such as a mirror or pools of water, in the hope of detecting significant messages or visions. The objective might be personal guidance, prophecy, revelation, or inspiration, but down the ages, scrying in various forms also has been a prominent means of divination or fortune-telling.and it remains popular in occult circles.